Cupcakes 'n Daisies: Another Addition to Lifetime Quilt List . . . .
Talking about my quilt binders the last couple of days got me to thinking about what type of patterns I actually use the most, a pattern from a book, a pattern from a magazine, or a an individual pattern, like the patterns I bought at the quilt show. The majority of the patterns in my binder are from a magazine. This is Quilt # 22, Spice Market, one of the few quilts I made from a magazine pattern. I made this quilt in 2007 as a housewarming gift for a friend of my daughter's. This is the only picture I have of this quilt. This was back in the days when I made my poor husband hold up my quilts, he never did get the concept of holding them by the corners. Thankfully my quilt pictures have improved, I replaced my husband with a photography frame system. (other than the quilt holding thing, he's a keeper, so I only replaced him when it came to taking pictures of my quilts.) Unfortunately my daughter has lost touch with this friend so this is the only picture of this quilt I'll ever have. But at least I have one. The pattern is "Spice Market" by Bill Kerr and Weeks Ringle of FunQuilts. It was in the April 2007 edition of American Patchwork & Quilting. This was the suggested way to quilt this top, and that's what I went with, it turned out great. Here's another color option for this quilt....I just love it when designers do this, when only one colorway is shown, it's so easy to think of the pattern in just that one way. 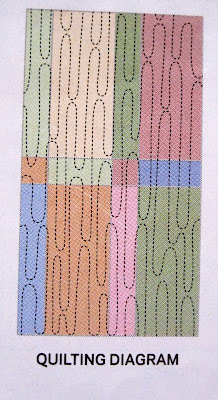 And finally, the pattern I blogged about on Tuesday, Trellis, it showed up as a class on The American Quilting blog, for a retreat they're organizing...if I lived in Utah, I would be there, February 18th. Check it out if you're in that area. Oh, I'd love to attend the American Quilting Retreat - talk about FUN! Maybe someday. I got a google alert about your quilt and wanted to see what you had done with our pattern. It looks great! Nice color choices and I'm glad you liked the quilting pattern too. Love those reds you picked up. I used some of them in my Snowball Challenge quilt. Spice Market is a terrific choice of pattern for batiks, I think. You made a fantastic selection of fabrics in yours. I have that magazine still, and you know I have a pile of batiks! This could be a good marriage! can't wait to see what you make with them. oh the reds are wonderful...I love red too! I love the batik quilt.... at least you have one picture of it. The reds and the polka dots are great! I am a red and white gal too. Can't wait to see it completed. Thelma the reds are so wonderful. I can't wait to see them all together in a finished project. Yum!!! I do live in Utah but won't be able to attend the retreat. One of these days I will get to one. I figure if I say that often enough, it will happen, LOL. Also loved the Spice Market quilt. Really beautiful. Between your post and the link to the projects for the retreat I was ready to jump up and head for the sewing machine. So many great ideas and beautiful projects. Thanks for sharing it all. Thelma, love your Spice Market quilt. It's a shame your daughter lost touch with her friend. I love the new red fabric you purchased. Can't wait to see what you make with it. What a great quilt! Your quilt holder for Spice Market looks just like mine...LOL! The Spice Market quilt is awesome. I love the reds . . . and know you are going to do something fabulous with them . . . can't wait to see . . .
can you tell me more about the photography frame system . . . I like that idea . . .